Today at Cedar Point David and I took a special opportunity to enjoy a unique and very exclusive gourmet meal. The dinner took place inside the G.A. Boeckling's Eerie Estate, which is one of the haunted houses at the park. Lucius and Sarah, who were in full makeup and costume, greeted us at the door. Once all of the guests arrived we were given a tour of the first part of the house and shown to the dinning room. David and I took out seats at the head table and dinner was served. 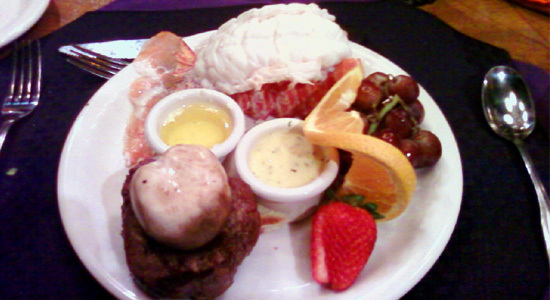 The menu had a choice of crab legs; lobster tail and petite filet mignon; char-grilled filet mignon with bearnaise sauce; or shrimp, scallop and lobster pasta alfredo. David and I both choose lobster and petite filet mignon. Our meals also included salad with raspberry dressing, twice-baked potato, buttered asparagus spears, rolls & butter and a "surprise" dessert. I also had a glass of Merlot. Each of the wait staff was also dressed in costume and wore ghoulish makeup. Lucius and Sarah also joined the staff to attend to us and assure us that we had a devilishly good time. 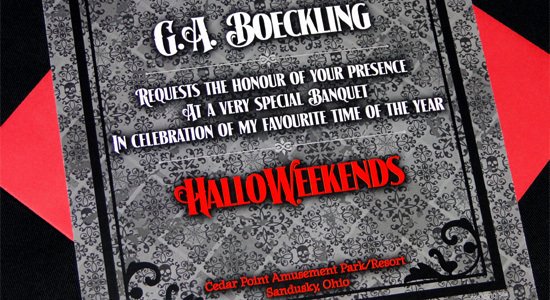 The staff sought out those patrons that were easily frightened and made them the highlight of the dinning activities. The lady sitting across from me at the table was the most targeted. At one point, a rubber mouse was given to her to care for. She was too scared to touch it or to even look at it. As the mouse quietly sat next to her plate she tried to hide it from view by placing her invitation in front of it. A noisemaker was given to one of the kids in the room to scare her as well. To our delight, she was also frightened by the occasional sound effect from the haunted house. Oh... our "surprise" dessert was a chocolate head filled with raspberry dessert. David's was a skull, while mine was Frankenstein. A little bit of raspberry sauce was placed around the neck to appear as blood and "R.I.P." was written on the plate. At the end of the meal Brian Poloski from Catering and Special Events spoke to us. He thanked us for coming and hoped we enjoyed the meal. He explained to us that the meal is meant to be special and exclusive. Brian said that there were 22 of us at the meal while there may be as many as forty thousand people in the park today. We were given our water goblets to take home as gifts. The goblets were in the shape of skulls supported by an hand and arm bone as the stem. As we exited we were shown the remainder of the haunted house tour. By far it was the best meal I've ever had at any amusement park. And for $65.00 it should be. The staff was great and very entertaining. They really made the experience special. I'll be sure to do this again next year with Sarah. Next, David and I spent the rest of the day enjoying a few shows before saying goodbye to the park for the year.